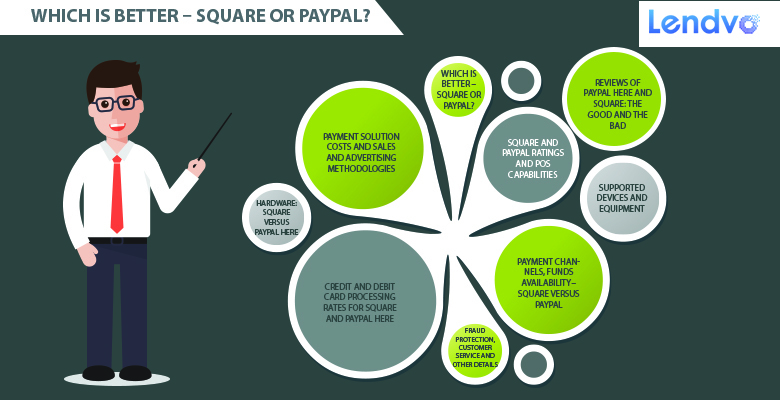 Home/Uncategorized/Which is Better – Square or PayPal? Like many businesses within the technology space, Square, founded in 2009, and Paypal, entering the PayPal Here for mobile payments in 2012, are vying for the market share of their respective online business. We will call this the fight for the ownership of the mobile payment market. Square which we have written an article on recently [insert new article link], citing it as the main force in the online payment industry, also has a lot of competition entering the market and PayPal, the technology giant between many things payment processing and they are putting up a fight and giving Square a run for their money. The product that PayPal is pushing out is called PayPal here and it has a lot of great features, but we still believe Square is the best online payment processing option that the market has to offer for the time being. We will go into some details below on the fees for credit and debit card processing rates, check processing rates, customer service capabilities of each, start up costs to use each of the products, the payment channels each product uses, fraud protection, which devices and equipment are compatible with each and which you need to make either product run successfully and their point of sale capabilities. PayPal is available in the United States and Canada while Square is available in the United States, Hong Kong and Australia . Square and PayPal monopolize, more or less, the mobile payment market and most customers can recognize immediately which service is which if they are familiar with accepting online payments. Their POS capabilities are mobile Point of Sale services that allow users to utilize their services by being on a cell phone or tablet. By using a cell phone or tablet users can accept credit cards from paying customers. Retail stores, pop-up retail shops, restaurants, repair businesses, trade shows, street vendors, coffee shops and a slew of other businesses are all adapting to using the mPOS or mobile payment systems. Both mPOS systems are said to give the customers what they need when they use this service. The main features of both Square and PayPal Here are relatively compatible as both accept all forms of credit, use barcodes and SKUs, have item libraries with product descriptions in addition to listing images, variants and product descriptions. Both services allow for you to apply discounts, issue partial and full refunds, record cash transactions, create invoices for clients, provide support to account for your cash drawer and the capability to send receipts by email and SMS text. There are a few things that Square offers free of charge like low-stock alerts, a virtual example and inventory management. The Square Dashboard is also an extremely beneficial feature that allows you to synchronize everything easily in your dashboard. PayPal also does not offer add-ones like the library and there is no offline mode that is slightly concerning. PayPal Here and Square similarly are both compatible with Android and iOS devices including tablets and smartphones. Square does offer more capabilities in general than PayPal Here because of the Square Dashboard that is essentially a hope office brought to you by Square. PayPal Here does actually support windows devices as well and the compatibility issues for each are a bit concerning. When you purchase PayPal Here and Square, in the competitive light, both do offer a free magstripe reader. Although, EMV chip readers are much recommended based on the changing landscape of the mobile payment processing world, some still opt for the free payment option that comes with the devices while we do recommend the more advanced technology. PayPal’s Miura M010 EMV reader is a Bluetooth-enabled all-in-one reader that supports NFC/contactless, EMV and magstripe. The design behind it also makes it very easy to use and allows it to fit comfortably in your hand. A charger does also come with it that works with Android and iOS devices while Square’s version is only capable of working with iOS. The Square reader is $29 and is sleeker than prior while the PayPal Card reader is $149; they do offer an incentive of a $100 rebate after processing of $3,000 in the first three months. Debit cards are the main payment channel for Square and PayPal Here. Both companies have a first name payment service that allows for the client of either company to charge customers by their name or image. Pay with Square is the service that Square uses while PayPal Here tracks its users through their PayPal account. The services each have a similar functionality although PayPal has more users in this respect than Square does. Their capabilities here are similar, but the specific reader PayPal provides with the ability to accept PIN-based debit cards through a specific reader is an extremely important thing. PayPal Here accepts credit and signature debit cards, Visa, MasterCard, American Express and Discover cards, pay with Square and Electronic Invoices. The funds that come in become available on PayPal the next day and the immediate availability of funds is something they pride themselves on. PayPal Here works at a faster pace than Square when making the funds available. Although the funds are not deposited directly into a user’s account. Yet, PayPal Here users can withdraw funds by using a PayPal debit card by using an ATM. The transfer process to a bank from a PayPal account requires you to take three days when doing this transfer. Square allows user’s to receive funds to their checking account the following day after a deposit is made. PayPal Here and Square offer very similar rates for clients charging customers my the swipe and keyed payments. The swiped payments done by Square are at 2.75% with the keyed fees at 3.50% plus $0.15. The PayPal Here payments are a bit less coming in at $2.70% for PayPal Here and the keyed payments are the same at 3.50% and another $0.15. Square charges no credit card transaction fee and offers a flat processing rate for its clients which has helped it remain an advanced player in the mPOS game. Merchant account are often at the backdrop of competing mobile solutions that deal with third-party mobile applications like ROAMpay. ROAMpay transaction fees come in at $0.25 The lesser swiped percentage fee implemented by PayPal Here certainly is a jab directly at the mPOS behemoth Square. The rate charge of 2.70% for PayPal Here is not a significant amount less than the 2.70% by PayPal Here, but it is certainly enough to make customers thing twice about that extra 0.05% based on how many charges they are making per year and how many clients they estimate to be using swipe payments as it is after all less money at the end of the day for the client. The Square 2.75% rate is for merchants who “on board” themselves. There is also a per-transaction fee that comes into play when using Square if you use the “get pricing” option on their website. There are also additional payments and options for square and PayPal Here that should be noted. International cards are respective fees of 3.5% + $0.15 for PayPal Here and 3.5% +$0.15 for Square. International cards add 1% to fees for PayPal Here and Square offers keyed rates for this. The chargeback fee for PayPal Here is $20 and is nothing for Square. The fraud protection and security on PayPal Here uses an encrypted card reader and data transmission; the same is used for the Square reader. Check processing rates are not offered for Square but are free with PayPal while the start up costs depends on the reader for Square and PayPal. Start up Cost for Square is free pending what reader you use and the same goes for PayPal. PayPal Hub Home allows you to get any and all questions answered and organized by topic while the PayPal Community forum allows you to get answers from other PayPal customers on similar questions that you may have. Social media @AskPayPal is available from Monday-Friday from 9 a.m. to 5 p.m. central time and you will usually be able to receive an answer this way. The phone and email options from PayPal say the service is still somewhat inconsistent. The Customer Service for Square is a bit spotty as it is only offered on the website ‘help center’, but customer complaints have noted that they are very difficult to contact. Usually, both companies do end up providing answers after requesting documentation on your given business that they need to get in order to answer questions you may have. The chip card reader both companies offer comes at a different cost than the basic free reader that they provide upon purchase of their product. Paypal is able to accept checks based on the backbone of its business and how long they have been around while, differing, Square is certainly more of a non-check oriented business and focused more on not using paper at all. When it comes to sales and advertising of their businesses, both companies offer effective mobile payment solutions including up-front pricing and no hidden fees. Limits are not listed although transactions are known to trigger reviews of accounts. PayPal has a hosted payment page and virtual terminal for $30 per month with recurring billing at $10 per month. The Advanced inventory through Shopventory is $25 per month. Square comes in with rates of Appointment Booking at $30 per month then Loyalty fees at $25 per month per location with the Virtual Terminal cost at no monthly fee, the recurring billing/card on file at 3.5% and $0.15 per transaction. The Advanced Inventory through Shopventory costs $25 per month. Something that keeps PayPal ahead of the game in this respect is how quick the money becomes available for PayPal users. The mobile payments become available to the user nearly immediately if you are a user with a PayPal debit card. This allows you to spend your money right away. Square payments, contrastingly, will take 1-2 business days pending time and date of payment process. Payments made before 5 p.m. Pacific become available the following business day while payments made after 5 p.m. Pacific time become available the second business day. Instant deposit is also available for 1% of the transferred sum. ACH transfer from PayPal to your bank takes 3-4 days without a PayPal credit card. Recurring billing or a virtual terminal is more pricy with PayPal. The $10,000 dollar marker is the point that you will begin to process with the marginally lower rate that will not save you money in virtual terminal transactions. The Android and iOS devices being accepted to both PayPal Here and Square are created to achieve maximum capability from Square if you are working on an iPad. Contrastingly, PayPal Here works with an array of Windows devices also. The compatibility of Square and PayPal Here is quite similar and both have a lot of positive assets when it comes to their offerings. The register with Square and the ability to be able to check so many things in your dashboard is certainly a positive in the grand scheme of things when dealing with these two companies. PayPal Here also uses receipt printers, barcard scanners and cash drawers. You can buy this for a fee through Square and also through the POS Portal for PayPal Here. Buying them at bulk up front will save you money in the long run as opposed to buying the items individually. Depending what you desire for your business, the price points for buying individually or in bulk will vary. Square has the better technology when it comes to these more advanced items to complement the smart device and a card reader. You can certainly tell that PayPal Here is an outlet of the larger company PayPal because they have not put as much into the development of their hardware in comparison with Square. The Better Business Bureau, or BBB, is a good judge of businesses and PayPal Here has more positive reviews on the whole than Square while Square does have some positive reviews. There are reports on the internet of scams by Square and PayPal, which often times they are not able to do anything about. There are upwards of 6,000 complaints on the PayPal main page which it slightly concerning to us. The continuity of their business models has been questioned over the years for both companies. The level of risk involved to the practice of their mPOS businesses is slightly concerning because we never know what really goes on fully in the electronic / technological world behind what we do know. The account termination for these companies is painful and can take you 90 to 180 days to get your money back. Both companies have a wide variety of complaints and are not perfect in either regard; the truth is, a lot of good reviews have been made about Square over the years, but there are also a lot of happy customers with Square. A merchant account with a mobile option is another good option to Square and PayPal. Some customers even opt to open an account with Square, use that mainly then open a PayPal account as a backup option if you encounter a problem. There are a lot of invalidated and wordy complaints on the BBB website. Yet, there is a way to tell how the Office of Executive Escalations, the forum that handles BBB accounts, plays into how PayPal and Square approach their customer service issues. As we said above in the customer service section, Square is not the top notch customer service team in the mPOS game and based on the responses Square has given and reviews by customers on BBB, RipOffReport and other websites, it seems that Square is acknowledged in the industry for not providing real and justifiable responses to its customers while other customers for PayPal do not that PayPal’s customer service team has been more helpful in assisting customers to resolve their problems by listening to the issues and working with them to resolve an issue. At the end of the day, it does seem that Square is still offering the best product in the business despite their lack of customer service expertise and the truth may be that they think their service is so good that they do not need to provide the best customer service because they don’t have any problems which is never the case. On the other end of the spectrum, PayPal has been around longer so the launch of PayPal Here seems to be taking on the life of the respected PayPal support team in general.